Click for more fabric details. Centre cut hole with or without a ring. Ideal for outdoor umbrella holes. All sizes shown are finished tablecloth sizes. You must account for your own over hang. Maximum tablecloth widths are already shown. We can cut longer lengths if required. Base fabric: Water repellent treated poly-cotton blend. Helps prevents liquid penetration. Face: Thin layer of clear acrylic which helps maintain a soft feel whilst remaining wipe clean. Finish: Square & Rectangles are hemmed. Circles & ovals are edge bound as seen in the image. Sizes shown are for your connivence and not stock items. All tablecloths are cut to order. Sponge down immediately with a clean, damp sponge. In case of grease stains use water with soap. Product can be machine washed infrequently at maximum 40c. Use detergent sparingly and rinse thoroughly. Do not use bleach, fabric conditioner, tumble drying or dry cleaning. After washing, ironing the back re-activates the stain repellent treatment. 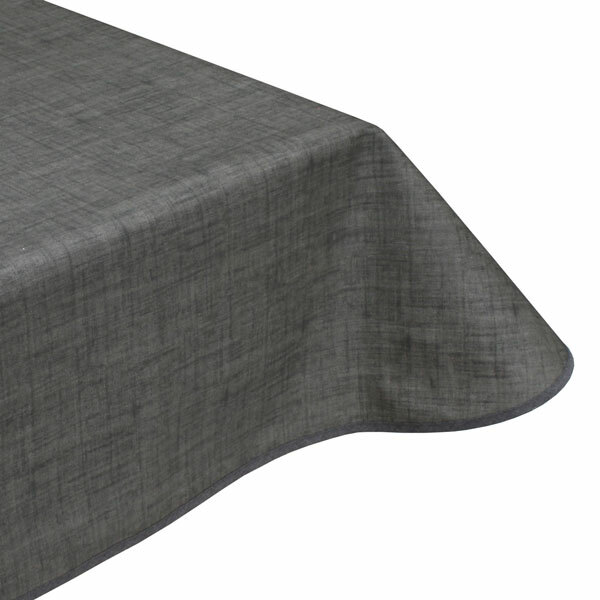 All of our Teflon tablecloths cut & finished to order. If your fabric is not currently in stock we will contact you via e-mail. We use Royal Mail and a signed for courier service to send out our parcels. All tablecloths are cut to order/made to measure items and cannot be returned unless there is a manufacturing fault or defect. If colour or quality is important to you then we suggest you order a free sample before placing your order. Listed shapes and sizes are there for your convenience and are not stock items.